A couple of posts ago I featured the mysterious Delta Blues photographer who goes only by the name Shein Die, who alerted me to a branch of blues called Bentonia Blues, named after a town in Mississippi. “It was started by Henry Stuckey who taught it to Skip James, Jack Owens and Little Jimmy Holmes”, the photographer told me. As many experts cite Henry Stuckey as the founder of Bentonia Blues, perhaps I should have said Bentonia Blues was made famous by Skip James. I’ve even seen it mentioned that Skip James ‘stole’ his style from ‘Pop’ Stuckey. Such are the claims and counter-claims that pepper blues history. Let me quote from the Big Legal Mess Records website which Shein Die alerted me to. 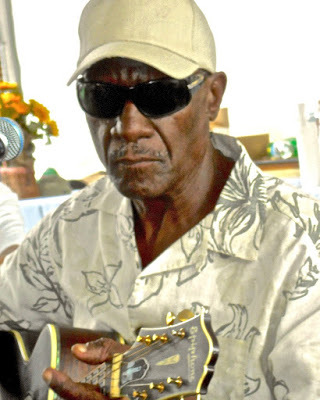 Big Legal Mess continues: “The origin of the style goes back to a chance meeting between Bentonian Henry Stuckey and black Bahamian soldiers in France during World War I. Stuckey learned an odd E-minor guitar tuning from the Bahamians and when he returned home taught it to his brother Jacob, and to Skip James and the younger Jack Owens. Big Legal Mess continues: “While Duck comes from a much younger generation, it seems he was destined to soak up the sounds and feel of the Bentonia style whether he was trying to or not. Born Jimmy Charles Holmes on July 28, 1947, Duck grew up two houses down from Henry and Jacob Stuckey. 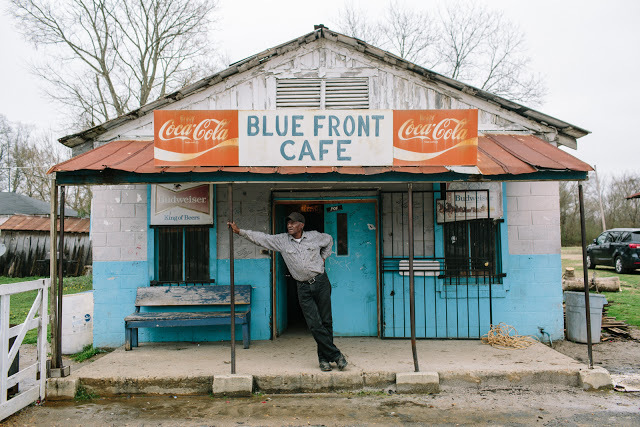 In 1948, his mother and father opened the Blue Front Café where they served cold drinks and offered live music. This music was often provided by the Stuckeys or Jack Owens and the local harmonica player Bud Spires. Duck Holmes on the famous porch. Photo courtesy of William Widmer, New Orleans. “When Duck took over the Blue Front in 1970, he began arranging for Jack (Owens) and Bud (Spires) to play more regularly at the café. With the encouragement of Jack, Duck began honing his skills and has emerged as one of, if not the only, living practitioners of the Bentonia style. As well as documenting life in the Delta blues community as it is today, through vibrant photography, the mysterious Shein Die also admits to playing some blues guitar, although not publically. However, this rule was broken during the trip to Bentonia, and what a tremendous experience it would have been. “I actually played at The Blue Front Café and Jimmy Duck told me awesome stories about Jack (Owens) who, actually, never met Skip (James)”, the photographer said. Should Shein Die share these stories with me, I’ll gladly pass them on. In the meantime, I’ve been researching Henry Stuckey a little further to try and determine whether he or Skip James was the originator of Bentonia Blues. Did Henry Stuckey’s tuning come from Bermuda? Very likely. 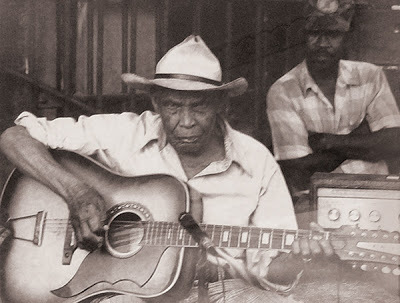 According to my Blues Who’s Who, Henry Stuckey was born in Bentonia, Yazoo County, Mississippi, in 1897. 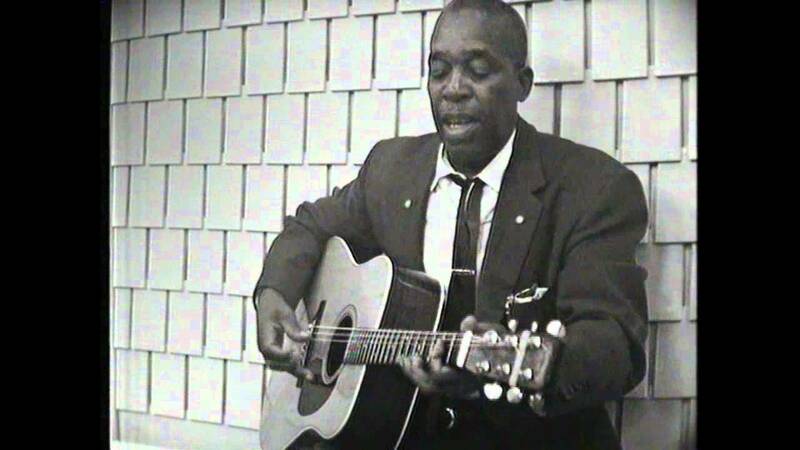 He taught himself guitar in 1905 and started working in Bentonia’s juke houses from 1908. In 1917, he served in the U.S. Army. The Who’s Who doesn’t mention Stuckey going to France with the army (where he was influenced by the Bahaman guitarists) but other blues sites, like the Mississippi Blues Trail’s, certainly do. Most say Stuckey was influenced by Caribbean tunings. Henry Stuckey, himself, says the MBT, “said he taught (the tunings) to Skip James, who went on to become the most famous of Bentonia’s musicians”. Stuckey and James, who was five years younger, worked the barrelhouses in the Bentonia area through the 1920s. During the 1930s, it seems Henry Stuckey stepped back from performing, owning and operating barrelhouses, playing just the occasional gig up to the 1950s. He then worked briefly in bands in Omaha, Nebraska. As a bit of trivia, Omaha, Nebraska, was where the first man known to have recorded a blues song came from. This was the white singer Morton Harvey who cut a vocal version of “The Memphis Blues” on October 2 1914, released in early 1915. While this won’t count as blues by many as it was by a white singer, it nevertheless features in my book as an important stepping stone in blues history. Indeed, the the first six years of singers recording the blues in the United States, all were white. It was only after black vaudevillian Mamie Smith reluctantly recorded “Crazy Blues’ in 1920 did the vocal style we now consider blues begin to develop. Said to be the only pic of Skip James. Really? While Henry Stuckey is usually cited as the Father of Bentonia Blues, there are those who beg to differ, such as the author of 2003’s The History of the Blues, the respected critic, Francis Davis. Best known as the jazz critic for The Village Voice, Davis suggests Bentonia Blues as a sub-genre is a latter day concoction because Skip James was “a complete original”. In other words, only Skip James could play like Skip James. That he came from Bentonia was incidental. So who exactly was Skip James? Born in Bentonia in 1902 as Nehemiah James, he was called Skippy as a child and the name stuck. 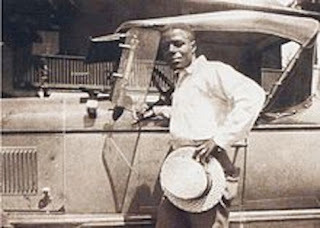 The son of a Baptist minister (and bootlegger), Skip dropped out of school to hobo around Mississippi and Arkansas, teaming up with Henry Stuckey on his return to Bentonia around 1918. Skip would have been just 16, Stuckey 21. 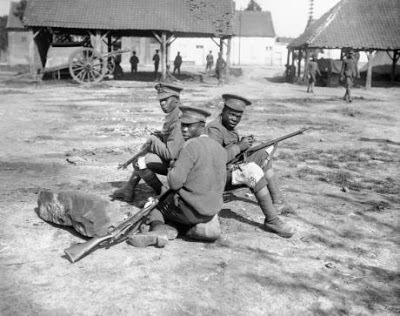 World War One would be over by year’s end. 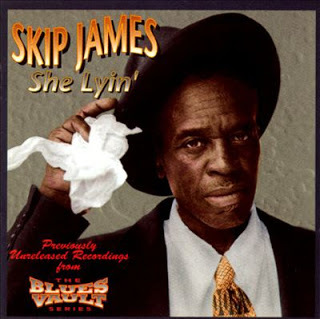 Like Robert Johnson, Skip James’ lasting impact is the result of a number of tracks recorded over a number of days in the 1930s. Johnson spent five days in Texas in 1936 and 1937 recording 26 tracks, plus variations. James recorded 18 songs for Paramount over two days in Wisconsin in 1931. While some of Johnson’s songs at least sold moderately well, James records sold poorly. However, James is said to have influenced Robert Johnson who rewrote some of James’ songs. Like his father, James also spent time as a bootlegger and church minister (in Dallas Texas). He returned to Bentonia in 1948, sometimes playing at the newly opened Blues Front Café although he no longer earned his living as a musician. Skip James’ fortunes changed when he was ‘discovered’ by three white blues enthusiasts in 1964. 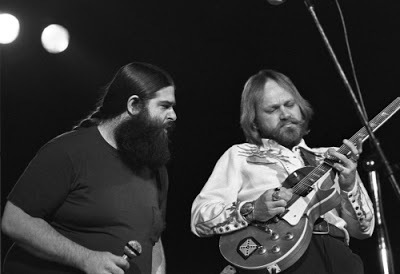 One was Henry Vestine who played guitar for the band Canned Heat from 1966 to 1969. Another was the finger-style guitarist John Fahey, and the third, Bill Barth, co-founded the Memphis Country Blues Society. James’ re-discovery, together with that of Son House, around the same time, is often said to have helped inspire the U.S. blues revival. James and Son House subsequently appeared with other re-discovered blues performers at the Newport Folk Festival in 1964. As for the last remaining Bentonia Blues performer, let me hand you over to Texas bluesman, CR Humphrey, who leads Old Gray Mule. A “gritty, raucous band” who play the Mississippi juke-joint circuit. Old Gray Mule also have a huge following in Australia where I am now. 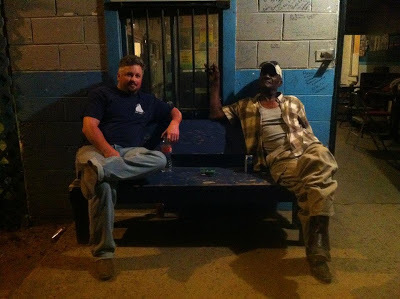 To read more about CR Humphrey’s take on Bentonia Blues, check his article on Wangarattajazz.com below.